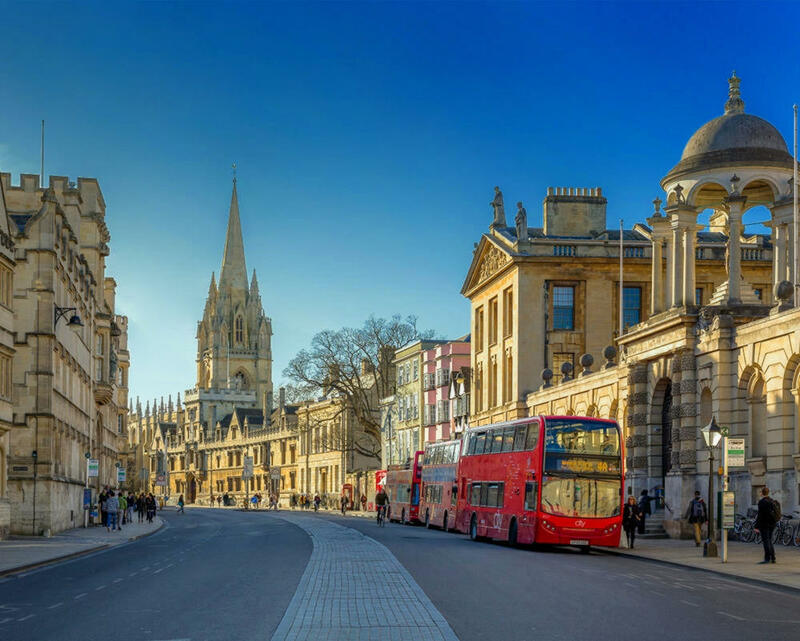 One of the most famous university cities in the world, Oxford is steeped in history, with beautiful honey-coloured college buildings dotted throughout the city. 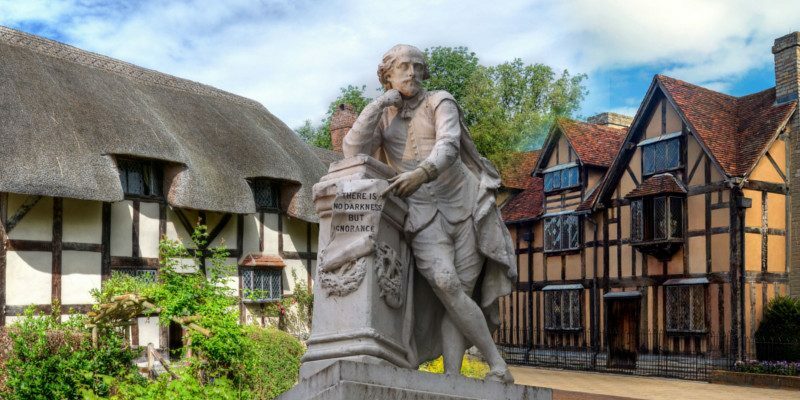 Wander the cobbled streets and peaceful courtyards and admire the famed spires reaching to the heavens as you contemplate the enormous wealth of human talent Oxford has given the world over the centuries. 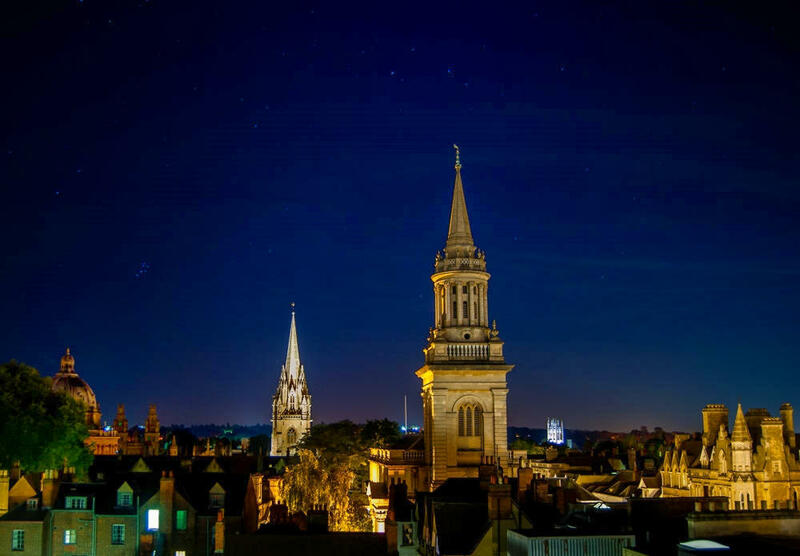 Here are 10 of our favorite things to love about Oxford. 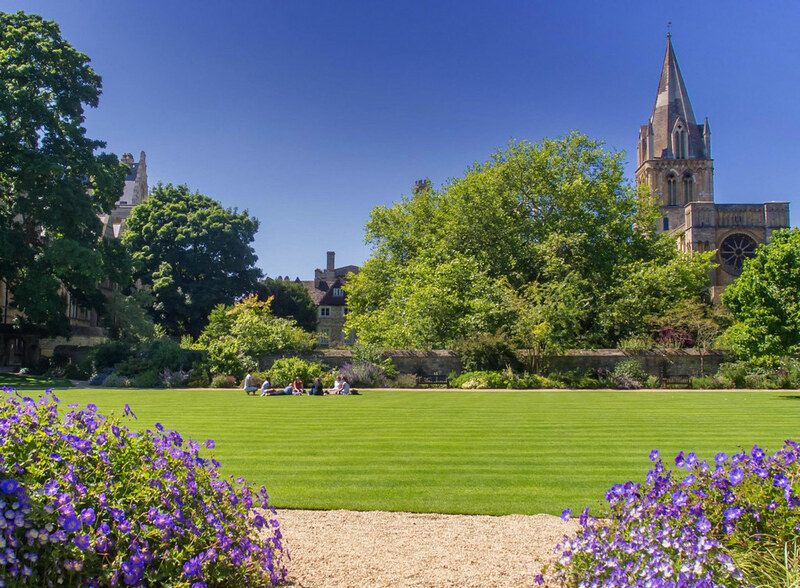 So beautiful were the views of Oxford from nearby Boar’s Hill that 19th-century poet Matthew Arnold was inspired to write a poem called Thyrsis in memory of his close friend and fellow poet Arthur Hugh Clough who lived in the city of dreaming spires. At 240 lines, Thyrsis is a long poem. Here are the first two stanzas. 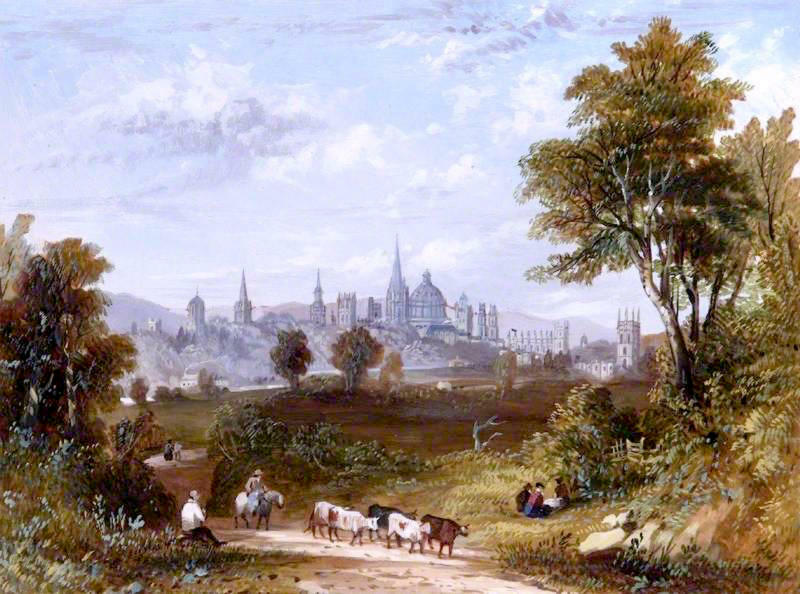 Today, those spires are best appreciated from atop St. Mary’s Church or Carfax Towers in the city center, or from South Park. 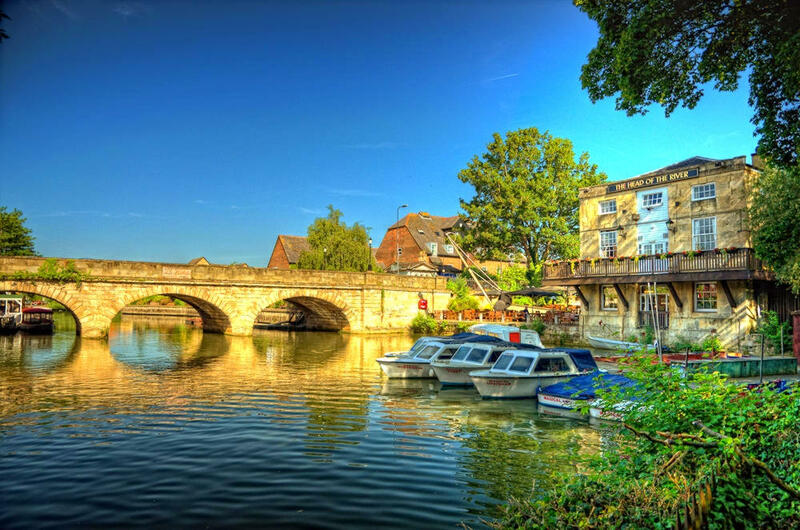 On this spot, where the Folly Bridge crosses the River Thames, basking in the golden glow of the evening sunlight, there was once a ford. 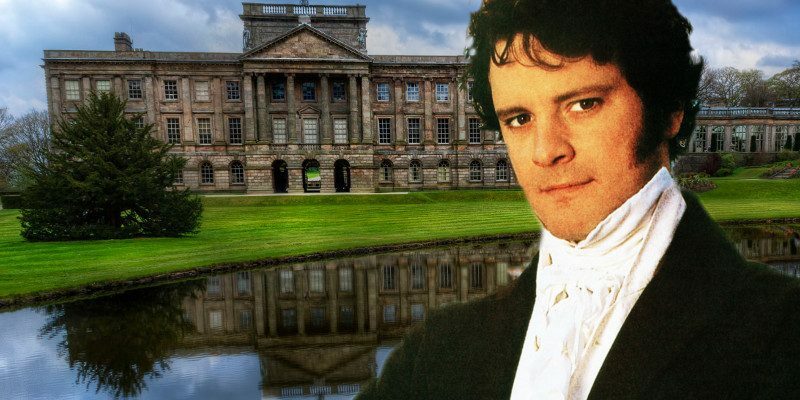 It was no ordinary ford. 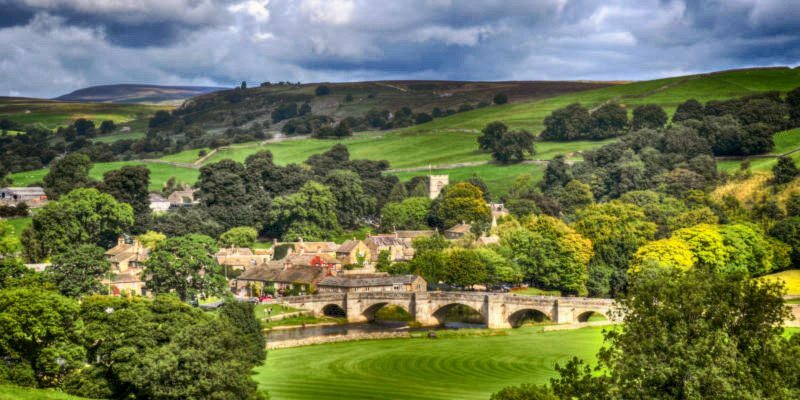 It was a ford to be crossed with a valuable cargo of oxen—”Oxnaforda” in Anglo-Saxon, from which Oxford derives its name. Oxen were the haulage lorries (trucks) of the Middle Ages, used for hauling carts and wagons and also for ploughing. 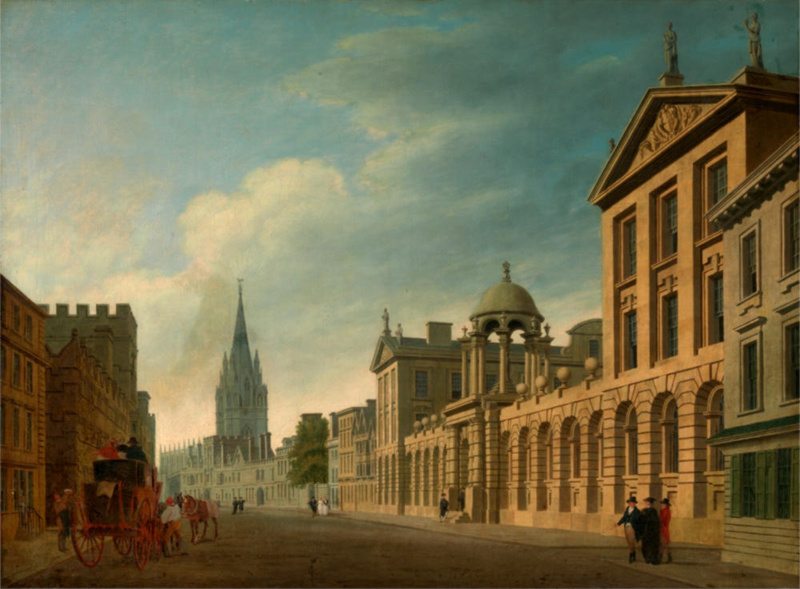 They were a form of wealth comparable to money, and Oxford might have been a major crossing point on a cattle “drove road”, along which they were driven for long distances. 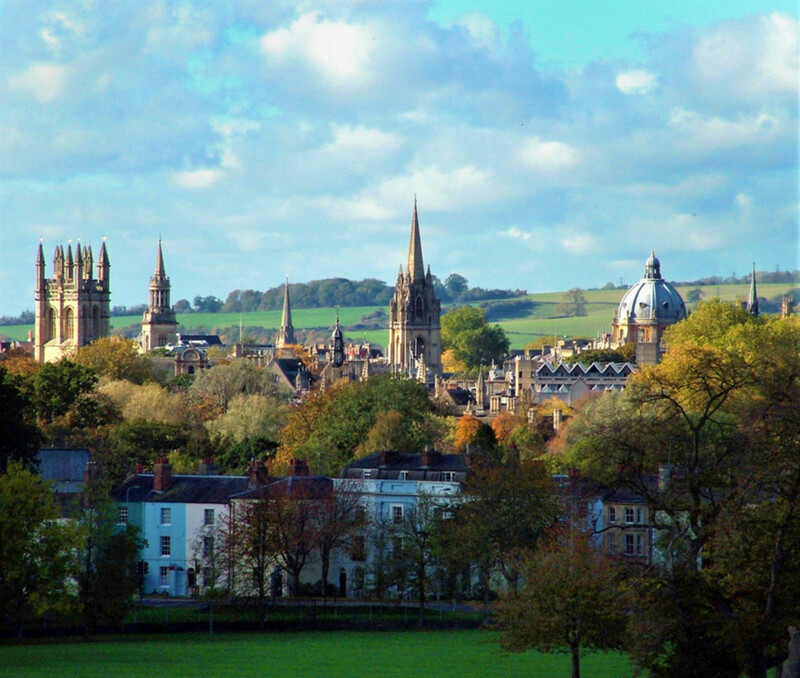 Another theory about the origins of Oxford’s name is that “Ox” derives from the Celtic word for river. 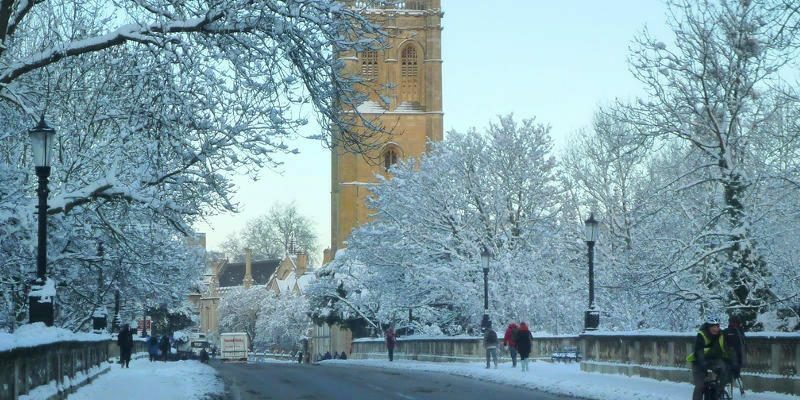 Either way, for history buffs, Oxford will not disappoint since centuries past remain to explore and enjoy. It’s nice to know that in this world of change, some things don’t change. 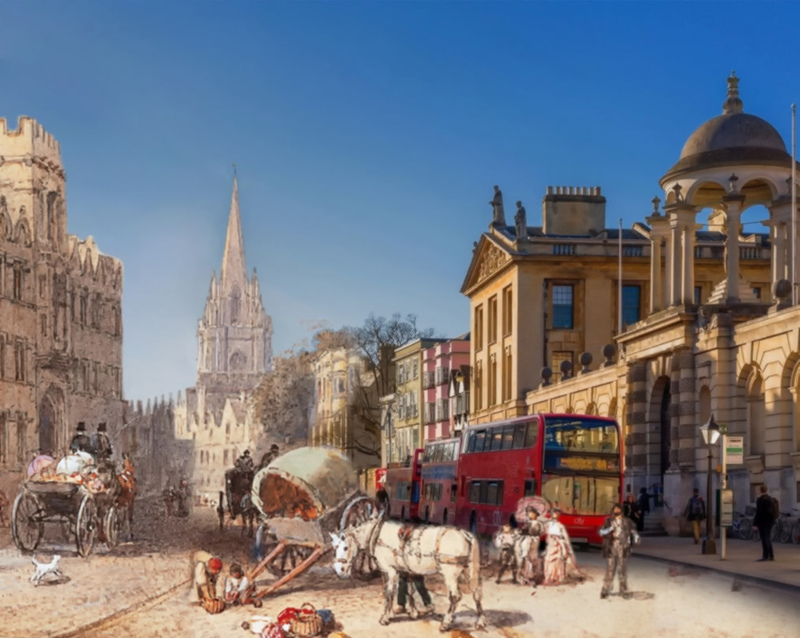 The carriages may be different, the people dressed differently, but Oxford High Street looks the same now as it did at the end of the 18th century. And that’s reassuring—some things are worth preserving. 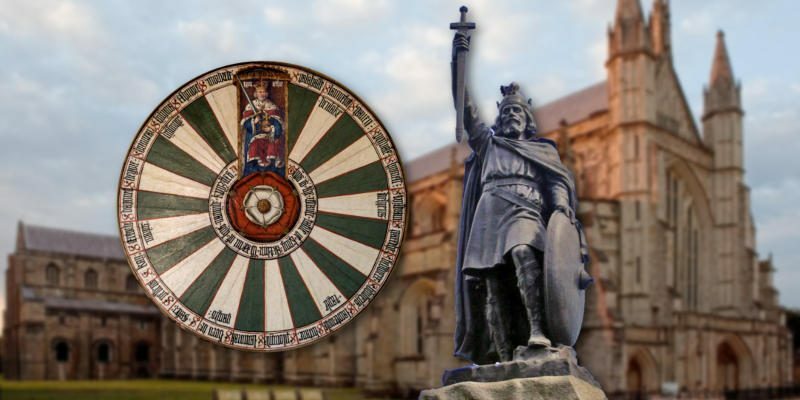 Evidence of teaching at Oxford dates as far back as 1096, making it the oldest university in the English-speaking world. 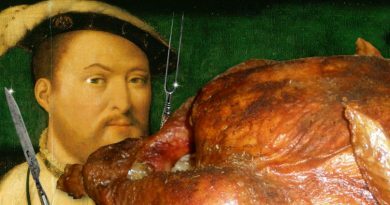 Banned from attending the University of Paris by King Henry II, students flocked to Oxford instead and the university grew rapidly from 1167. 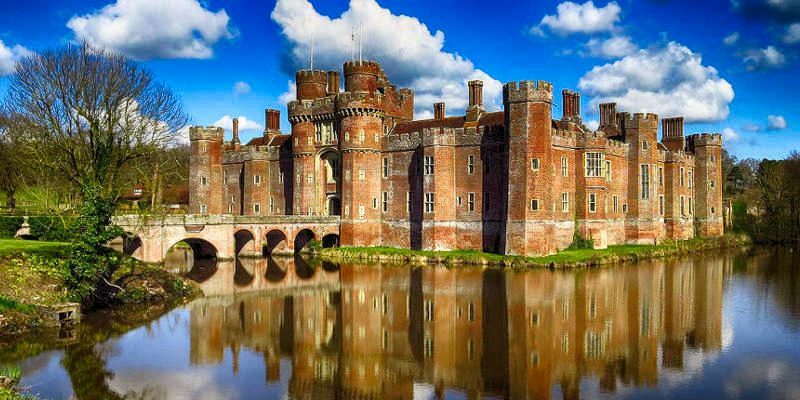 But in 1209, disputes between students and townspeople led some faculty to move north-east and establish Cambridge University. 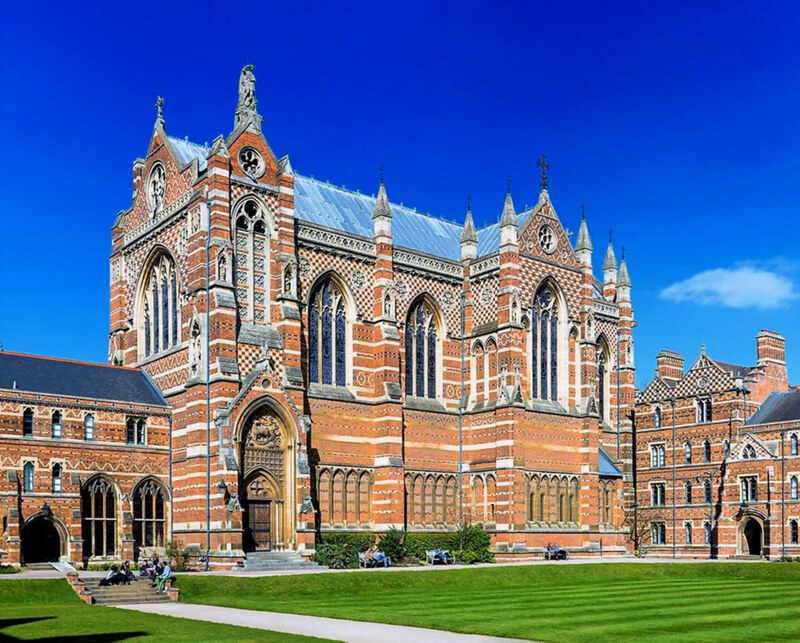 The two universities became known as “Oxbridge” and are frequently cited in the top five in world rankings, with Oxford currently rated #1 by the Times Higher Education World University Rankings 2016-2017. 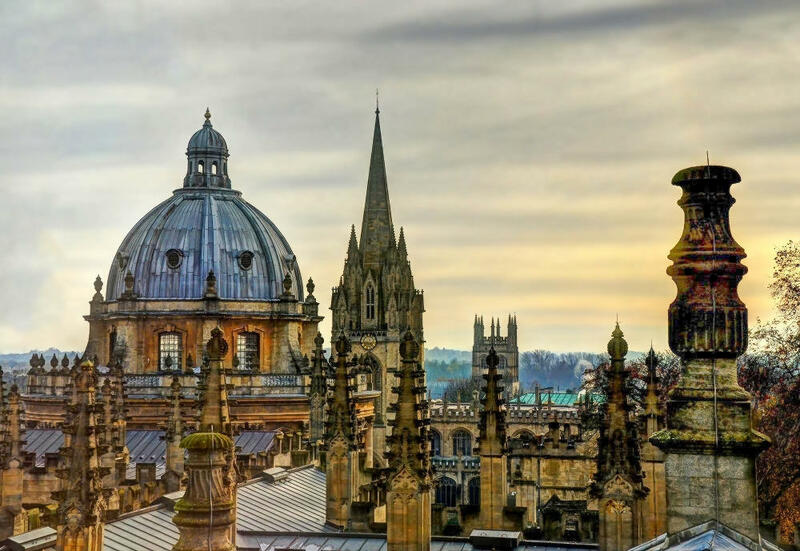 Oxford University has 38 constituent colleges and has educated many notable alumni, including 28 Nobel laureates, 27 British Prime Ministers, and many other heads of state. 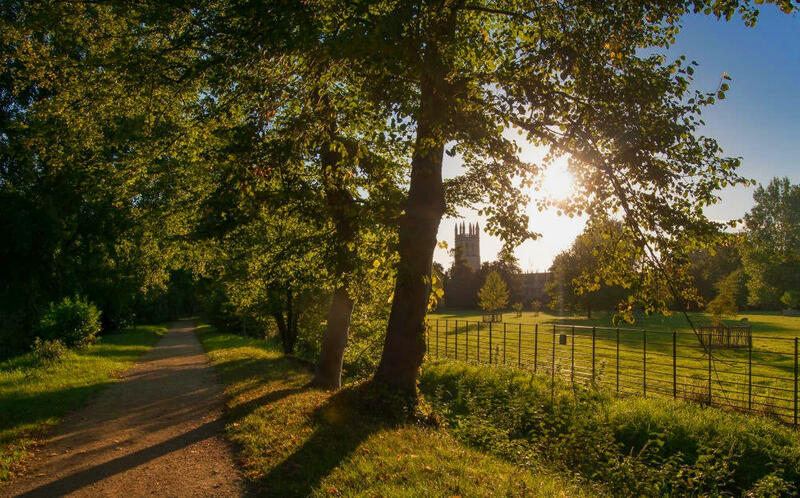 Christ Church alone has produced 13 British Prime Minsters—more than any other Oxbridge college. 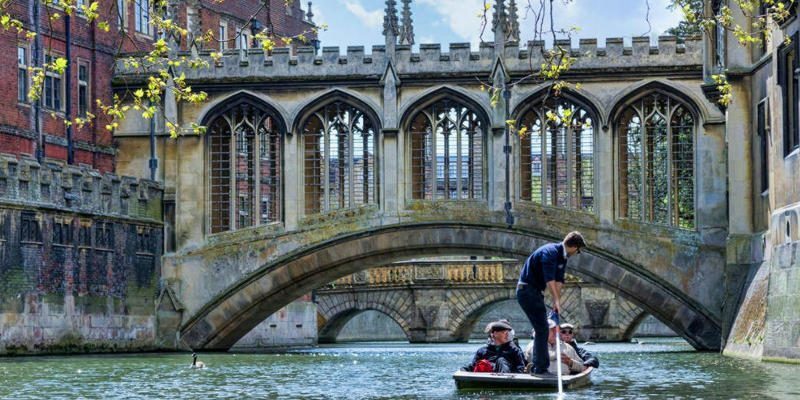 Known as the Bridge of Sighs because of its supposed similarity to the famous Bridge of Sighs in Venice, Hertford Bridge is, however, closer in appearance to the Rialto Bridge in Venice. 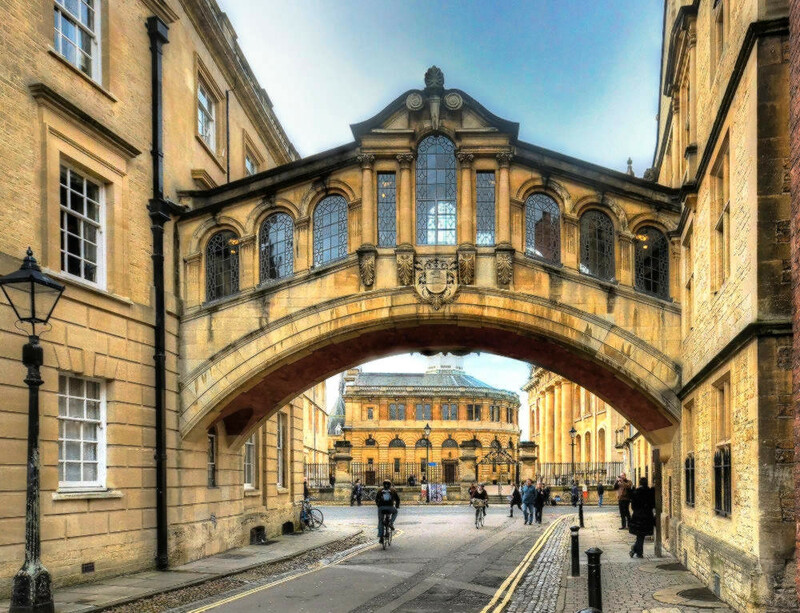 Built as a skyway over New College Lane, the “Bridge of Sighs” joins two parts of Hertford College and has become a city landmark. 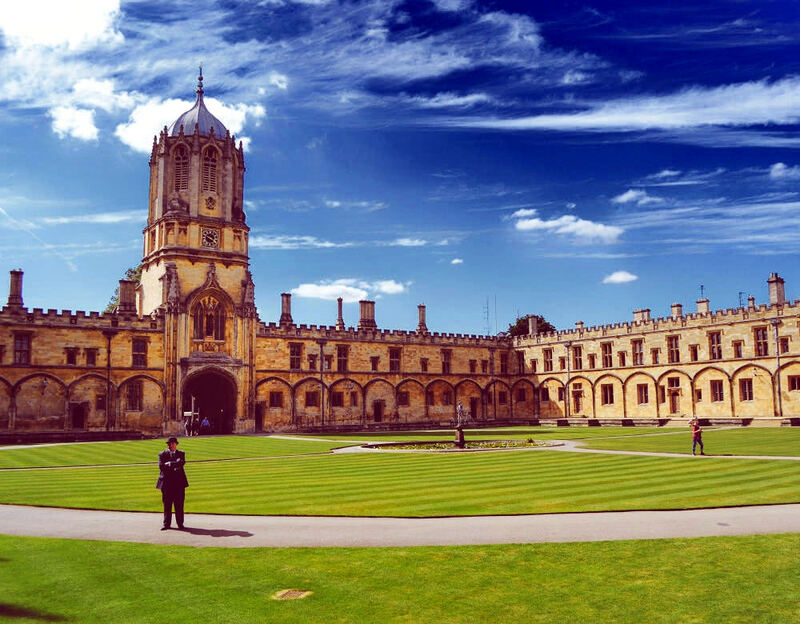 All Souls College was founded in 1438 and is unique in having only Fellows as members of the college, and no undergraduates. 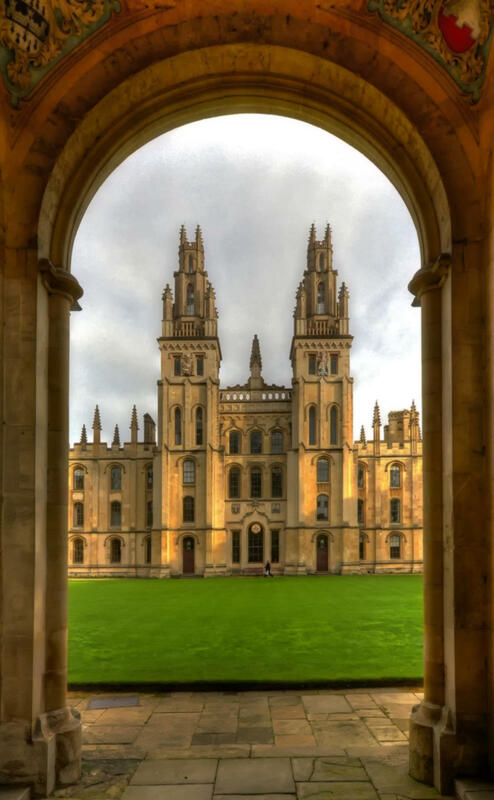 All Souls College features a magnificent quadrangle, with striking twin towers designed in the 1720s by Nicholas Hawksmoor in the Gothic style to harmonise with the medieval college chapel. 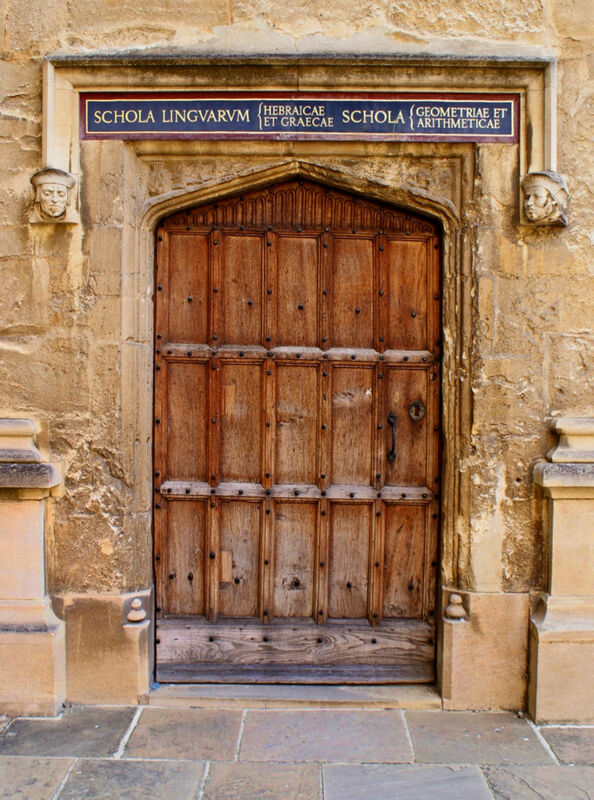 There are lots of old doors like this one all over Oxford and one thing is for certain: there’s a lot of scholarly things going on behind each one. 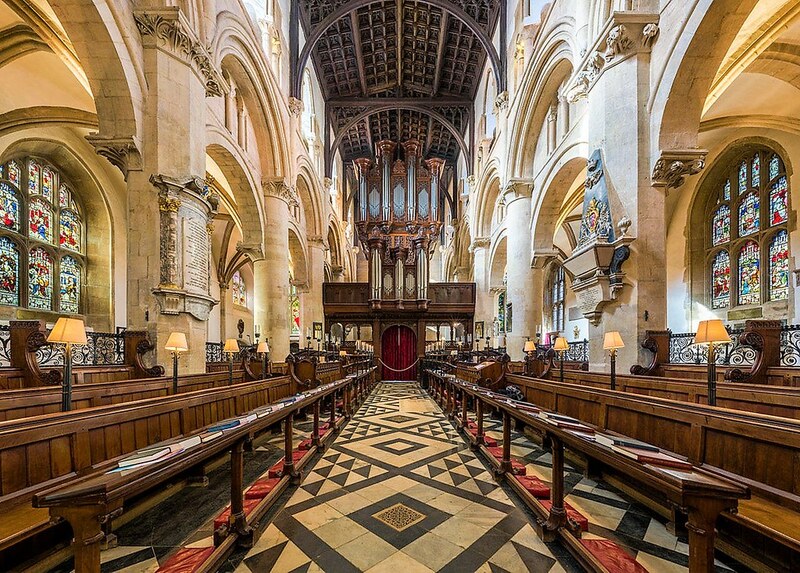 Demonstrating noteworthy examples of every English architectural period since the late 11th century, the historic buildings in Oxford make it an ideal location for film and TV crews. 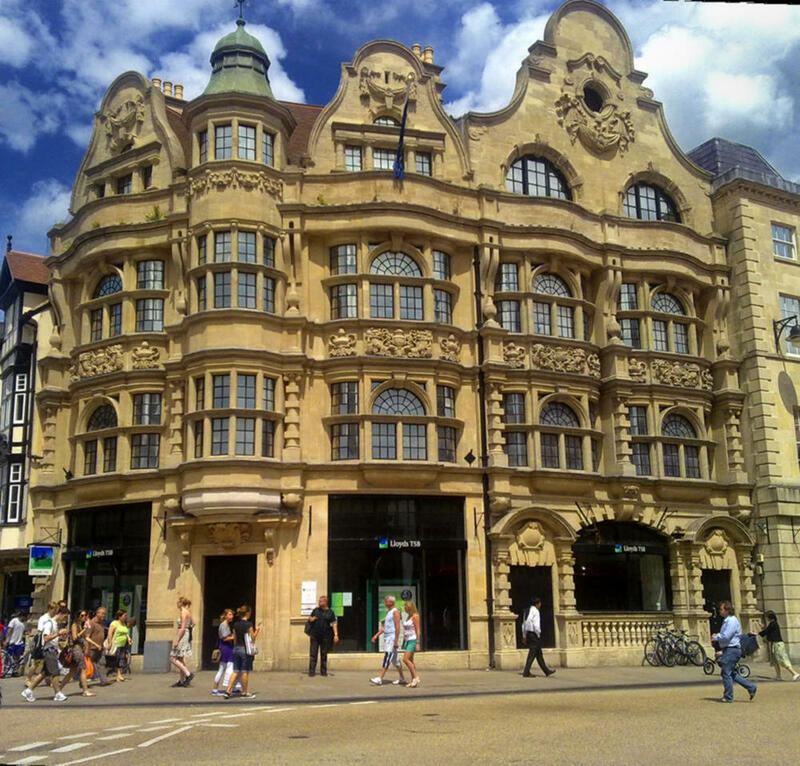 Occupied by the Carfax Tobacco Company and a branch of Lloyds Bank since first opening in 1901, the ornate Rennaissance Revival building marks the start of Oxford High Street. 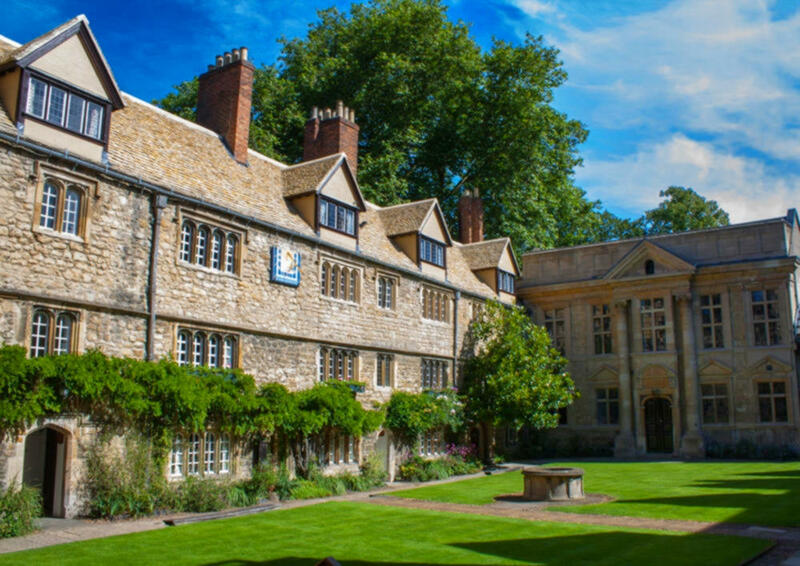 Further down the adjacent Cornmarket Street on the corner of Ship Street is a 14th-century timber-framed building originally built as the New Inn and now owned by Jesus College, which restored it in 1983. 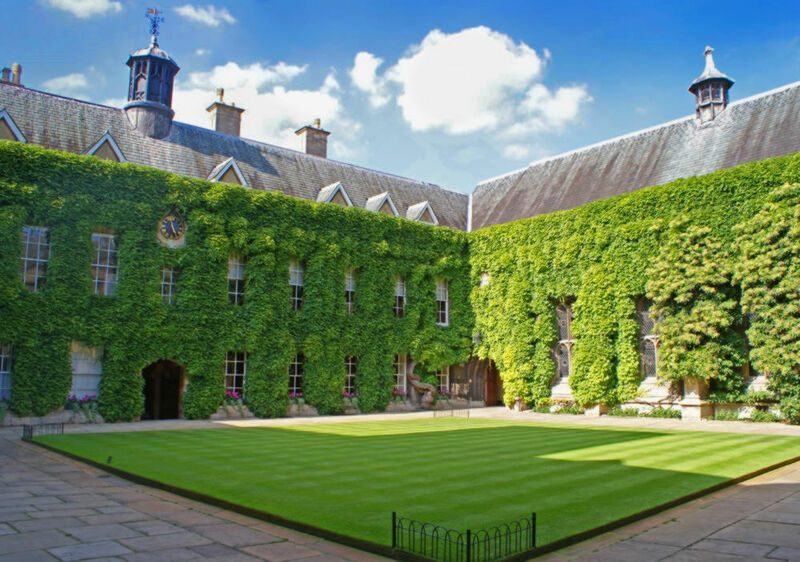 Jesus college was founded by Queen Elizabeth I in 1571. 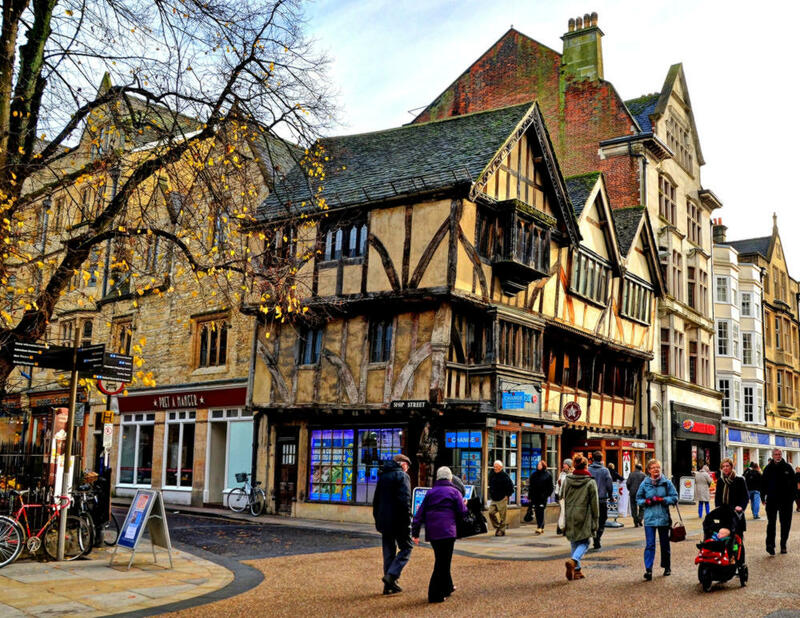 14th-century timber-framed building in Cornmarket Street, Oxford. 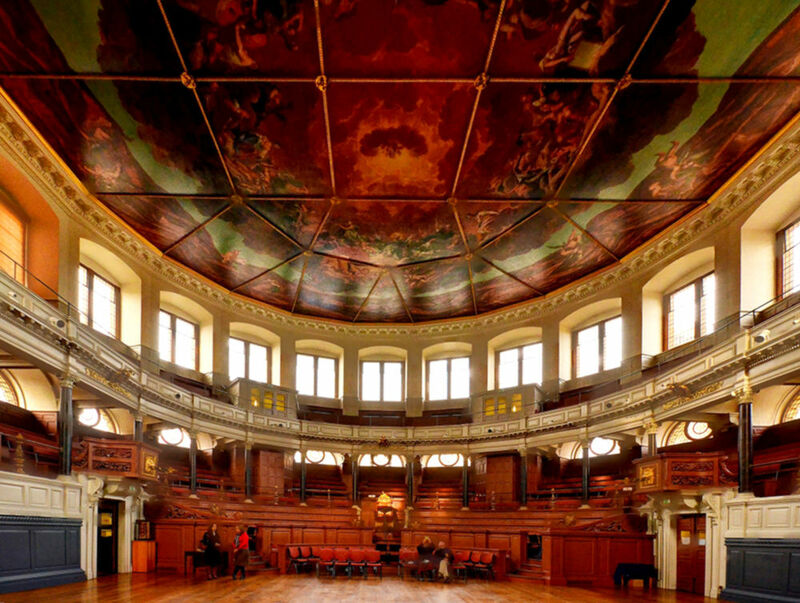 The Sheldonian Theatre was built for the University of Oxford between 1664 and 1669 after a design by Sir Christopher Wren who also designed and built St Paul’s Cathedral. 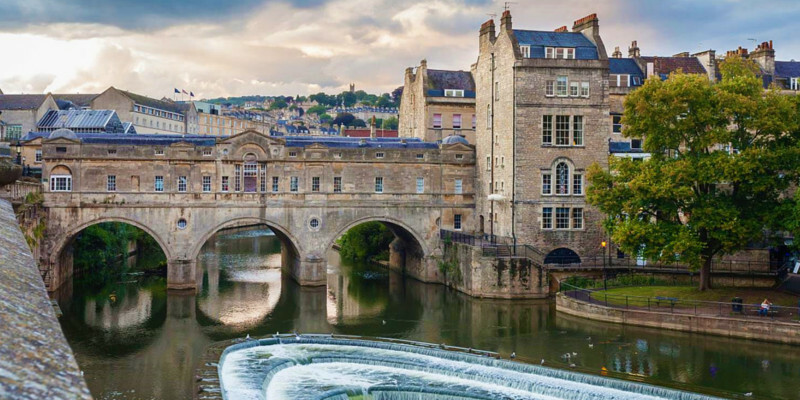 Named after Gilbert Sheldon, chancellor of the University from 1667 – 1669 and the project’s main financial backer, it is used for music concerts, lectures and University ceremonies. 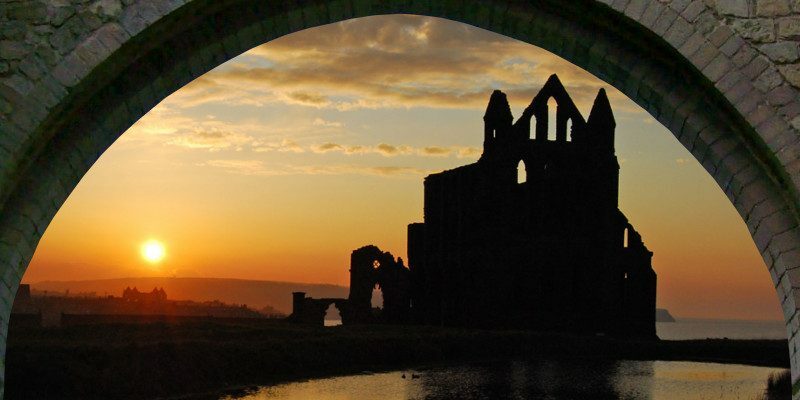 But since 2015 has it also been used for drama, with the Christ Church Dramatic Society staging a production of The Crucible. 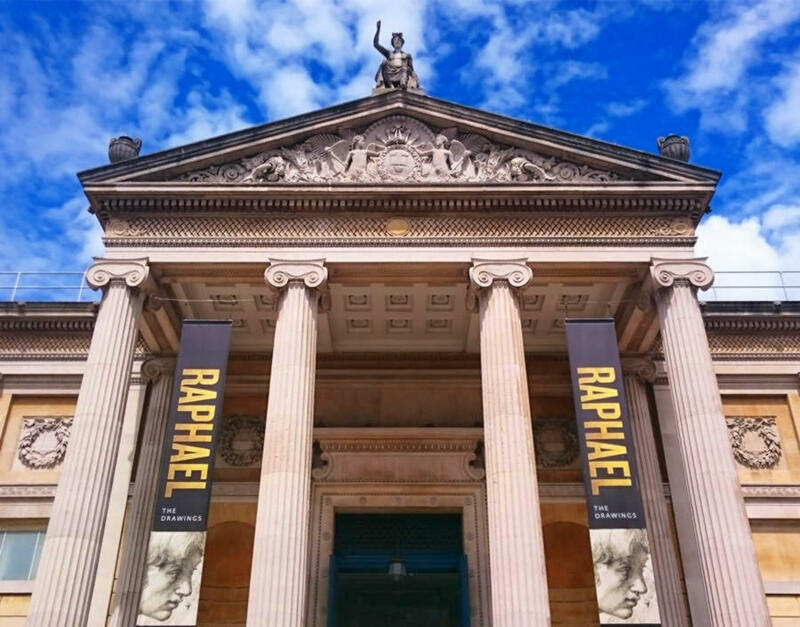 Established in 1683, the Ashmolean Museum was the world’s first university museum and is the oldest museum in the United Kingdom. Originally housing a “cabinet of curiosities” give to the University of Oxford in 1677, it now holds significant art and archeology works by Michelangelo, Leonardo da Vinci, Turner, and Picasso, as well as treasures such as the Scorpion Macehead, Parian Marble, the Alfred Jewel, and “The Messiah” Stradivarius violin—regarded by many as the world’s finest. 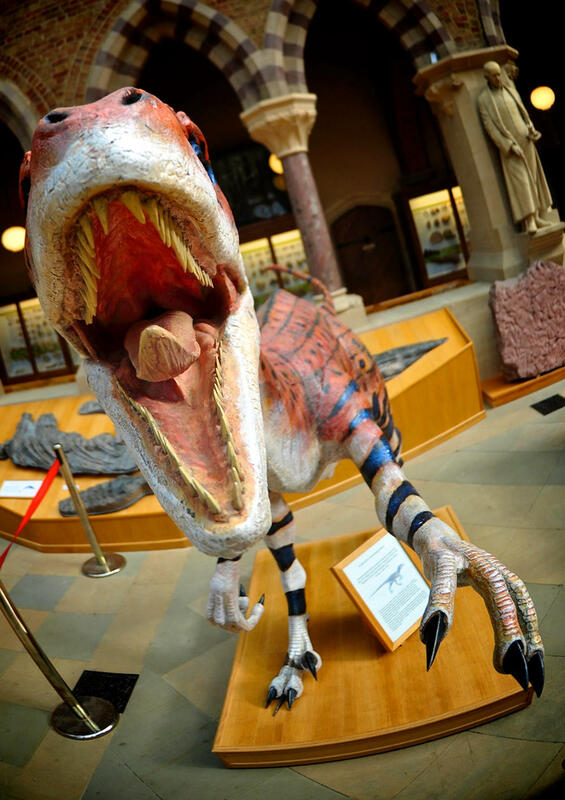 Housed in a large neo-Gothic building in Oxford University’s Science Area, the University Museum of Natural History boasts skeletons of a Tyrannosaurus rex and Triceratops, and the most complete remains of a dodo found anywhere in the world. 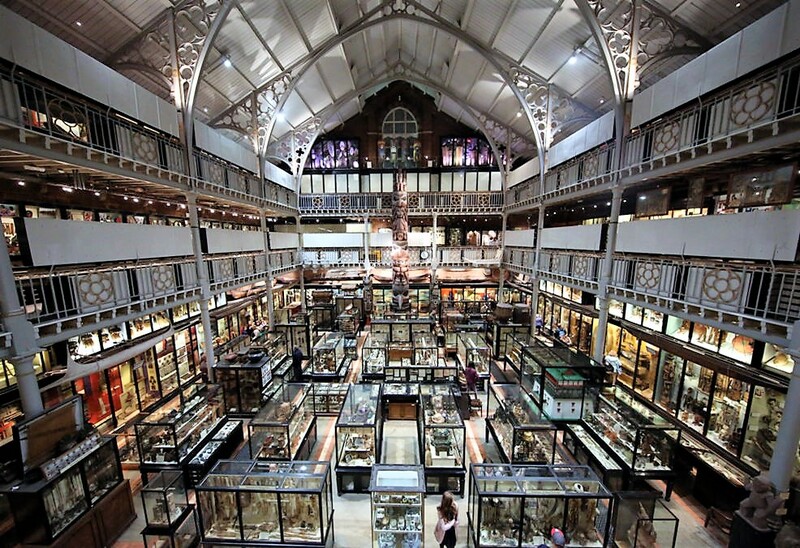 Founded in 1884, the Pitt Rivers Museum contains over 500,000 items from the University’s archaeological and anthropological collections. 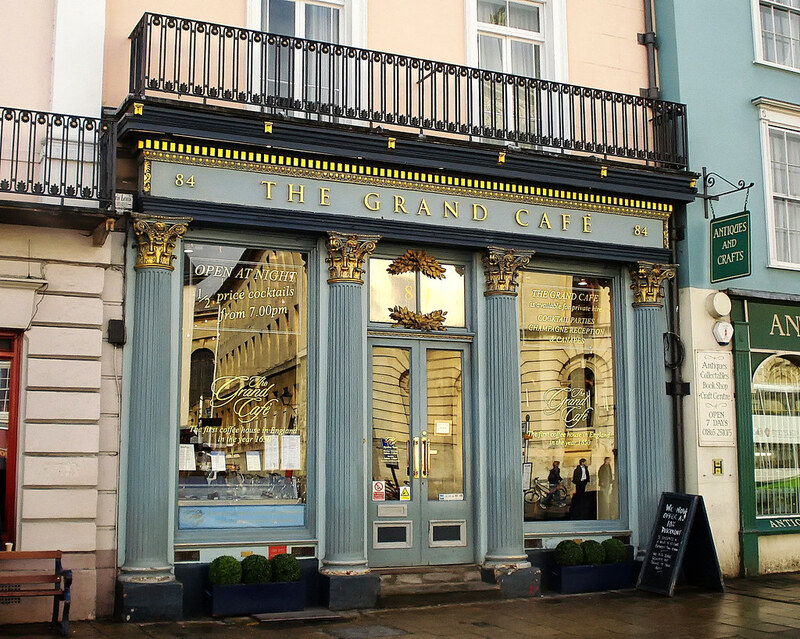 According to the famous 17th-century politician and diarist Samuel Pepys, the first English coffee house was established on the precise site of the Grand Café on Oxford’s High Street in 1650. This is where some of the great luminaries of the Enlightenment would meet to exchange ideas, acting as a supplementary sphere to the university. 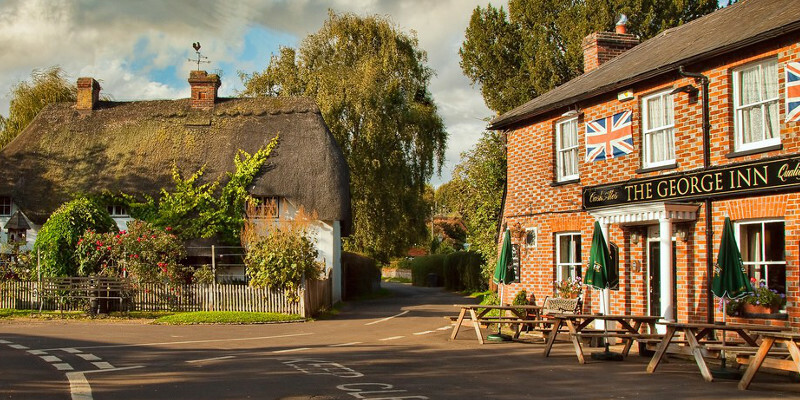 The absence of alcohol created an atmosphere more conducive to serious conversation than an alehouse. 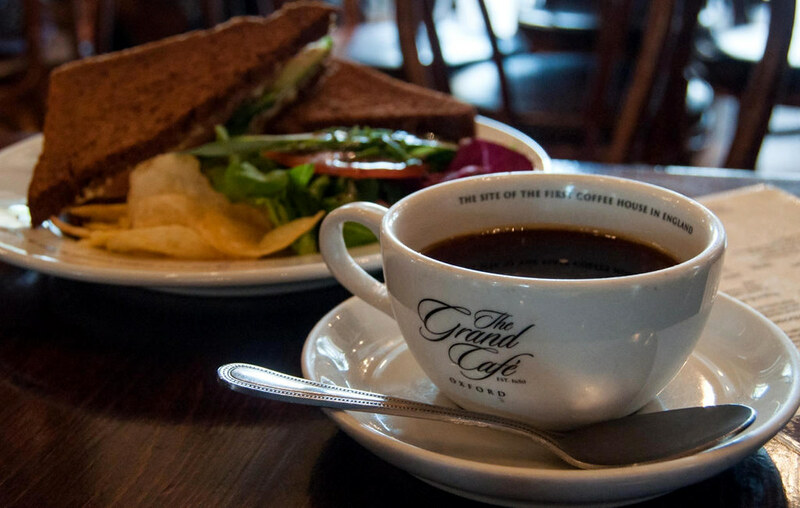 Coffeehouses also played an important role in the development of financial markets and newspapers, and political groups frequently used them as meeting places. 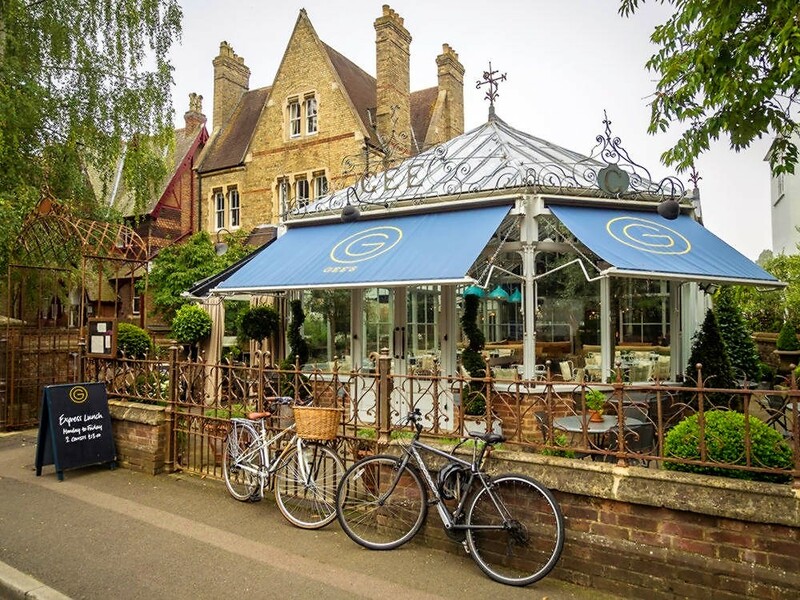 Oxford’s pubs overflow with enough character and atmosphere to stimulate the minds of some of the best fiction writers of all time. 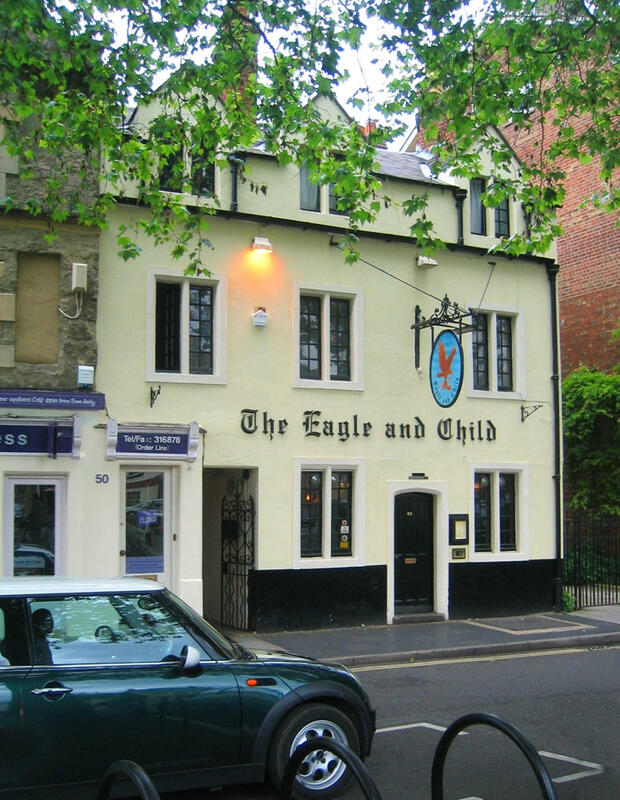 Meeting here every Tuesday morning between 1939 and 1962, C. S. Lewis, J. R. R. Tolkien and other friends, popularly known as the “Inklings” would drink beer and discuss the books they were writing. 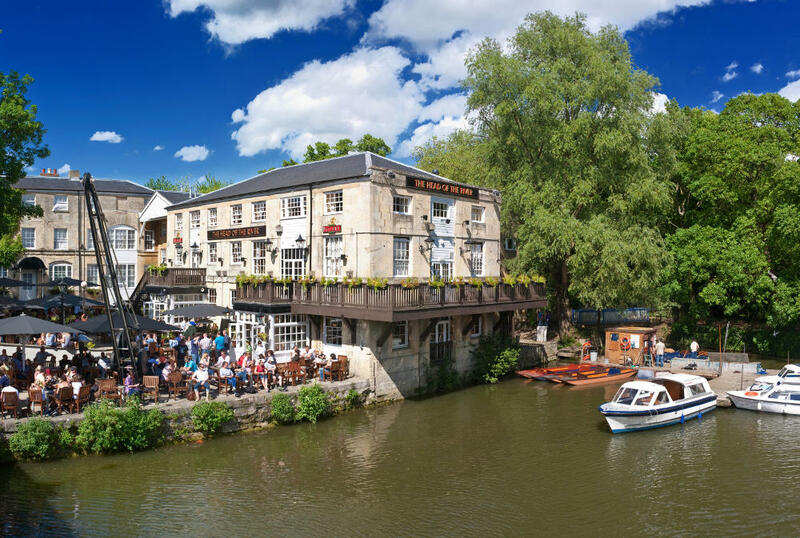 The Head of the River Pub is adjacent to Folly Bridge which crosses the River Thames at the point of the ancient ford for which Oxford is named. For light refreshment, why not try Gee’s Restaurant and bar, serving a uniquely rustic, Mediterranean dining experience set in an iconic Glasshouse. 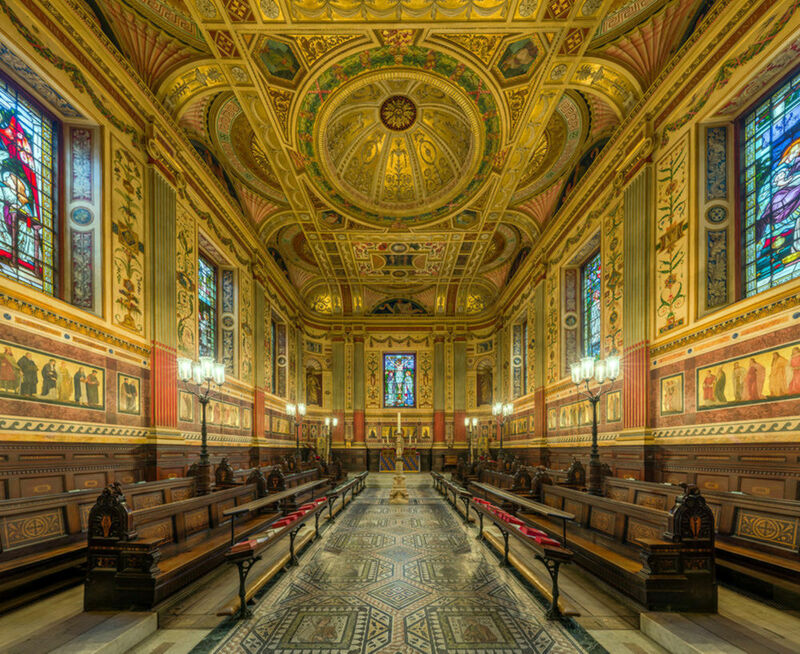 The University Church of St Mary the Virgin is the centre from which the University of Oxford grew. 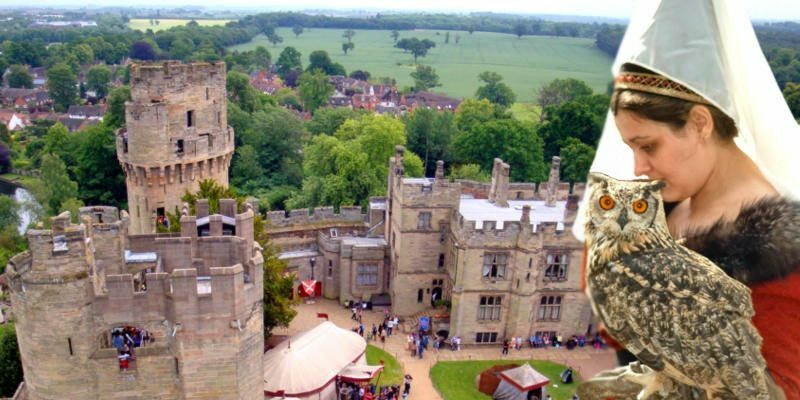 With an eccentric baroque porch, designed by Nicholas Stone, its spire is claimed by some church historians to be one of the most beautiful in England. 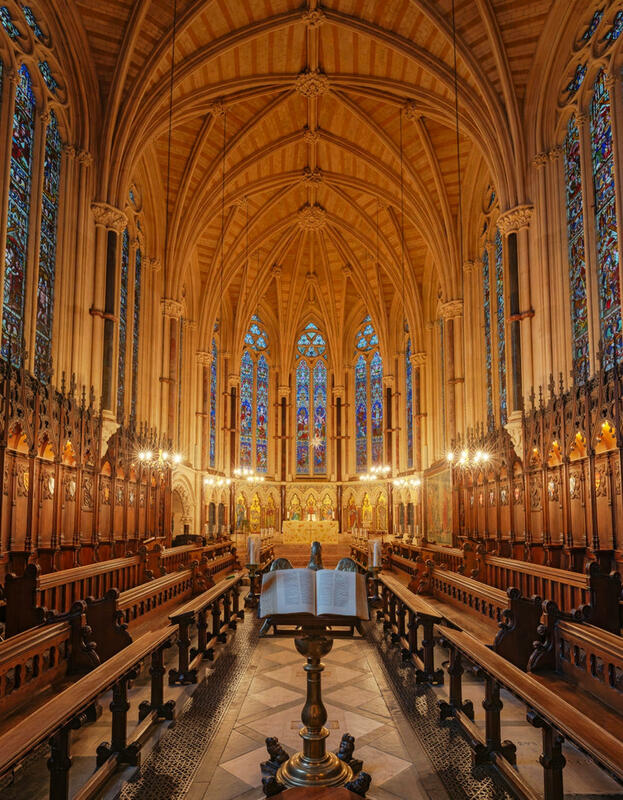 Designed by Sir George Gilbert Scott and constructed in 1854–60, the chapel at Exeter College, Oxford, was heavily inspired by the Sainte-Chapelle in Paris. 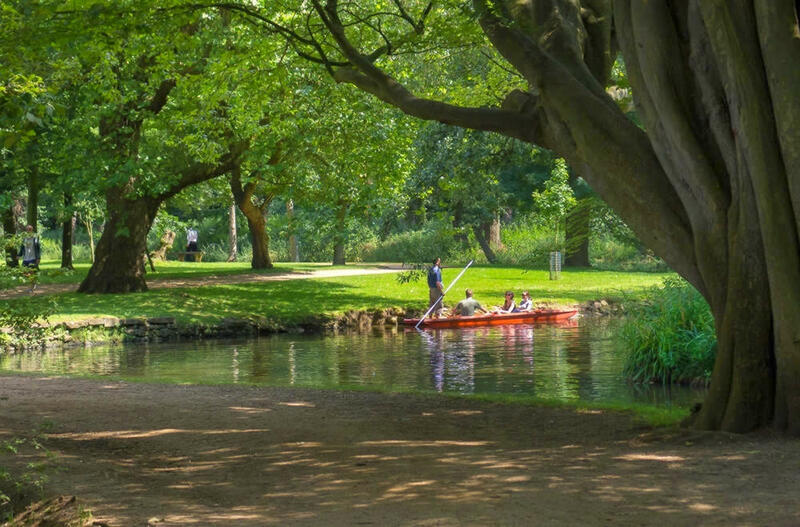 Oxford has 28 nature reserves within or just outside the city ring road, making it one of Britain greenest cities. 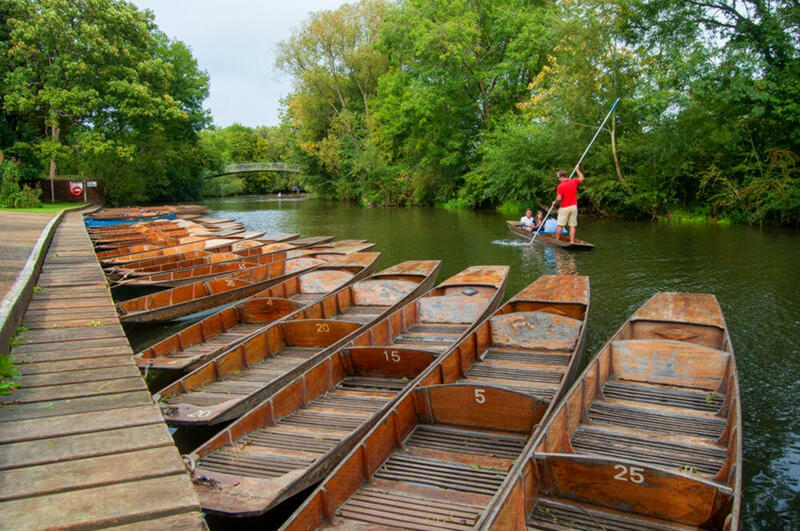 Whether you prefer a leisurely walk along one of Oxford’s many footpaths, a relaxing punt ride down the river, or an invigorating cycle ride, Oxford is a magical place for all. 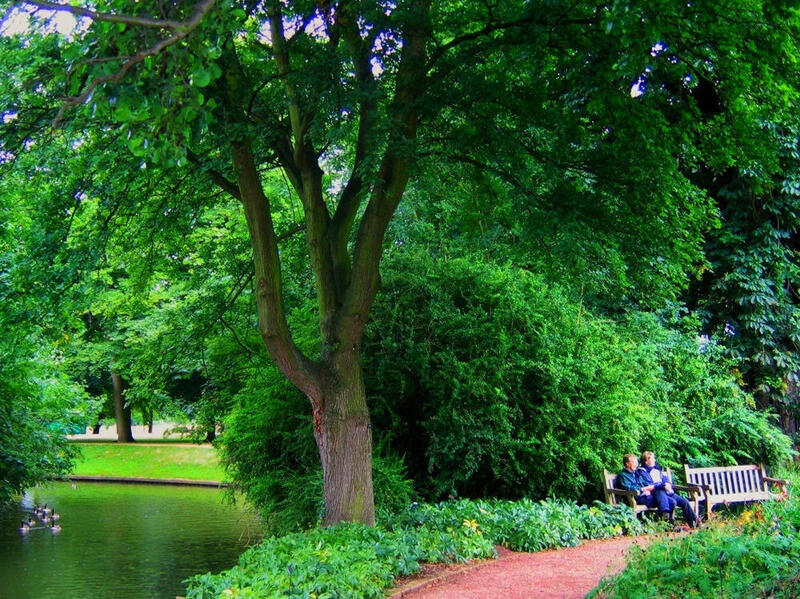 While away the hours in the peace and tranquility of Oxford’s Botanic Gardens. 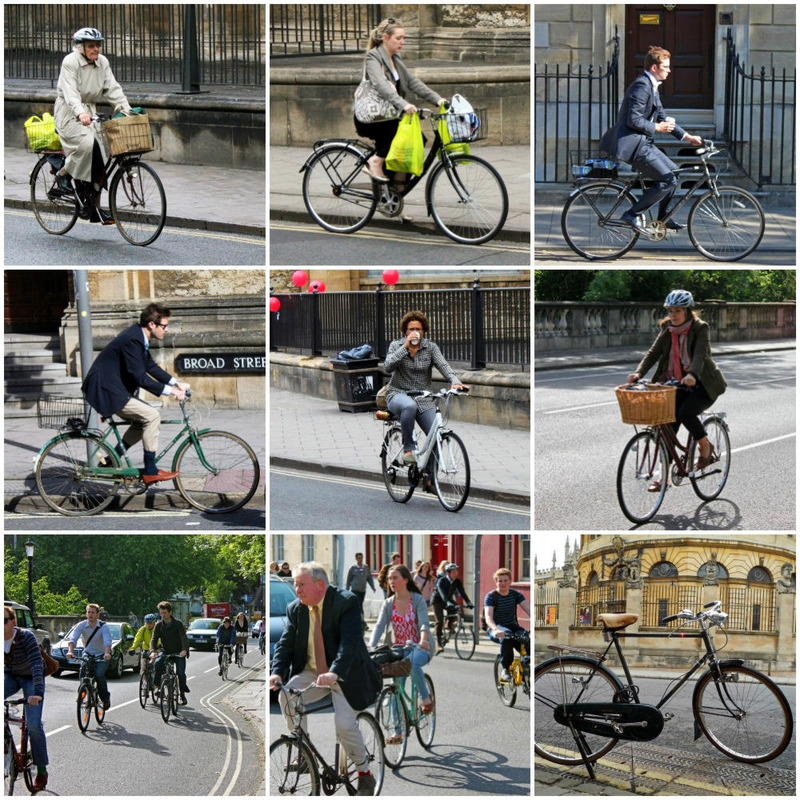 Oxford is second only to Cambridge in the popularity of cycling. 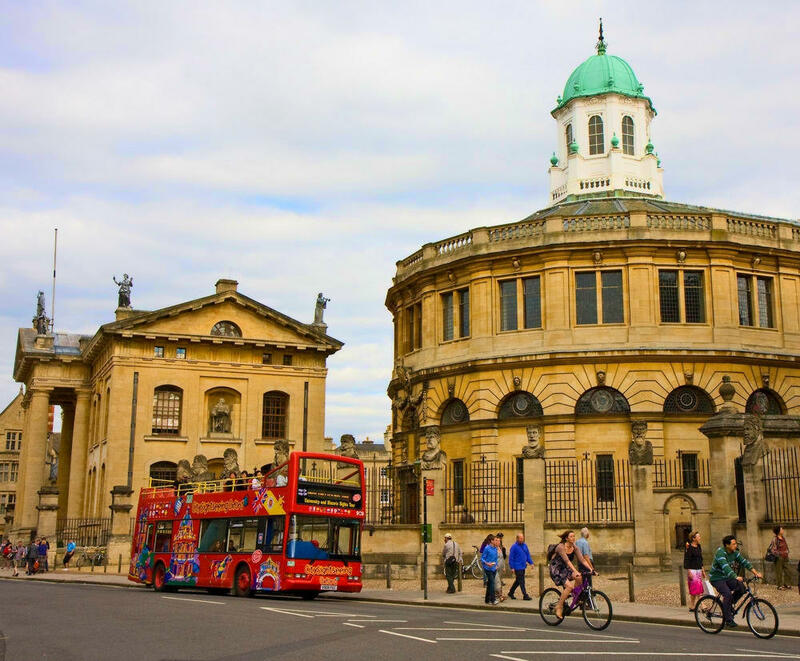 22% of Oxford’s residents ride three or more times per week. 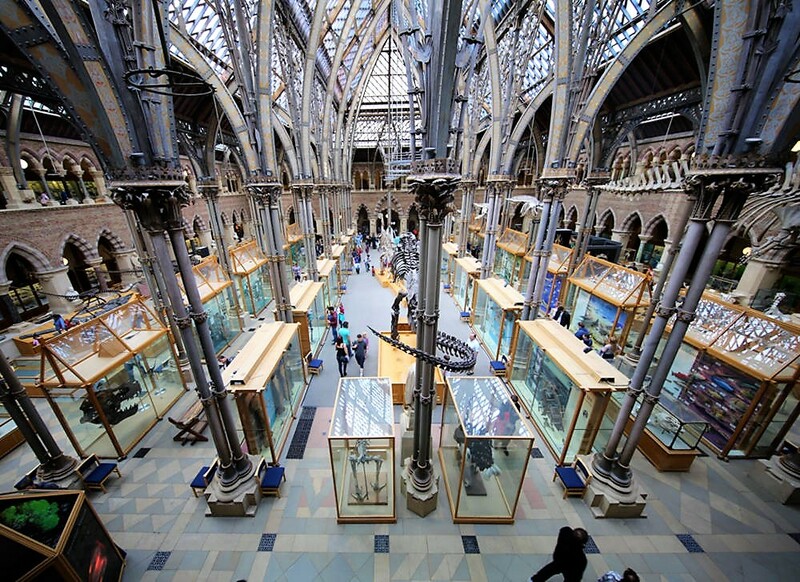 The University of Oxford maintains the largest university library system in the UK. 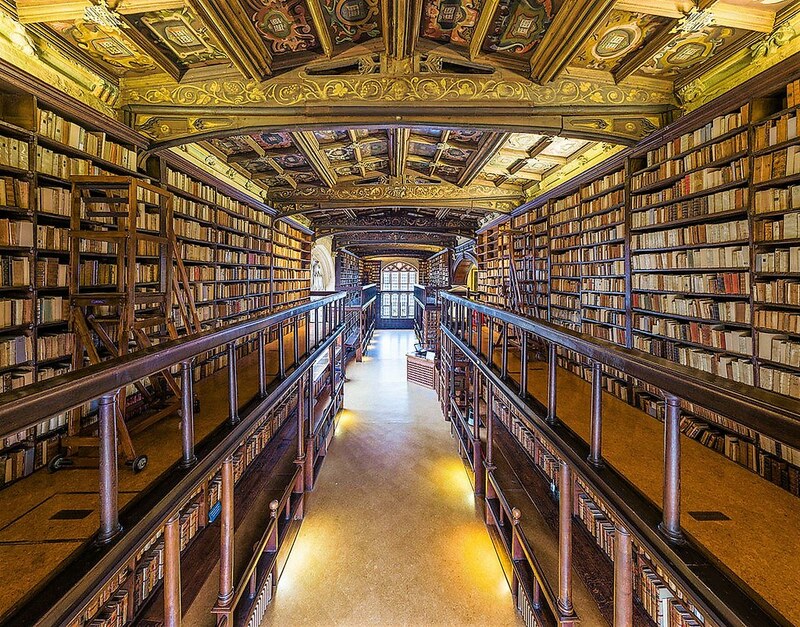 With over 11 million volumes housed on 120 miles (190 km) of shelving, the Bodleian group is the second-largest library in the UK, after the British Library. 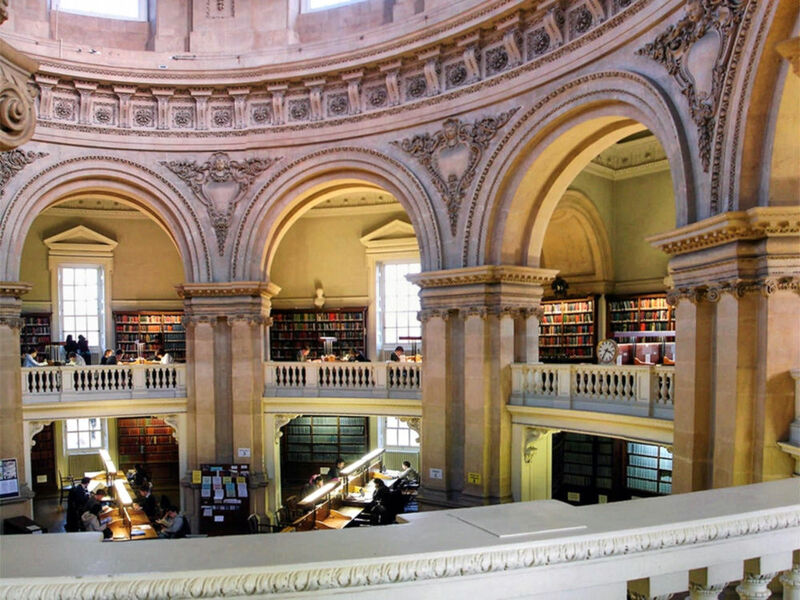 Entitled to a free copy of every book published in the UK, the Bodleian is growing its collection at a rate of over three miles (five kilometres) of shelving every year. 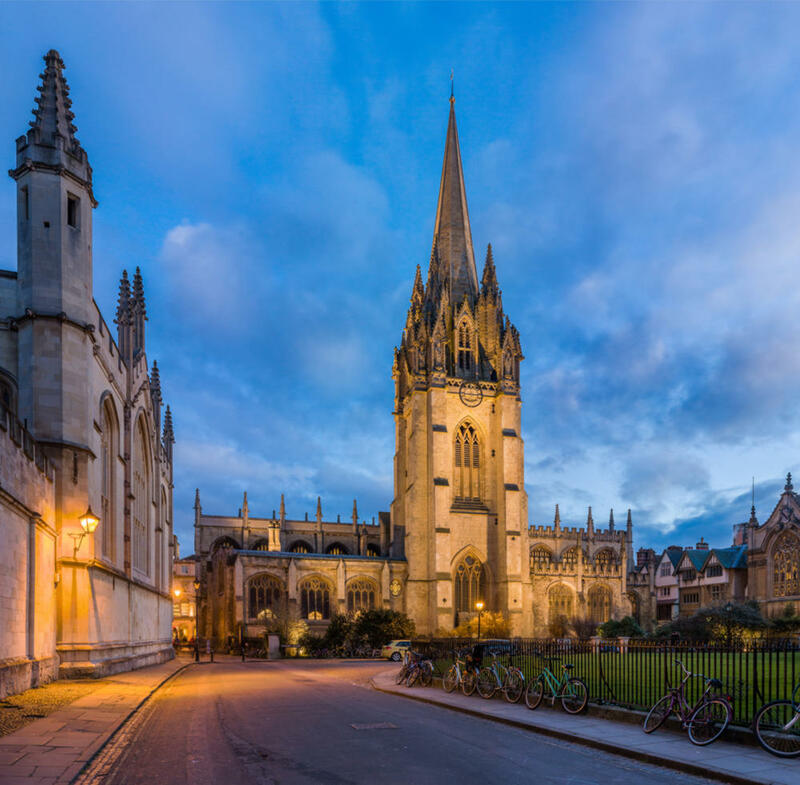 Visitors can take a guided tour of the Old Bodleian Library to see inside its historic rooms, including the 15th-century Divinity School, medieval Duke Humfrey’s Library, and the Radcliffe Camera. 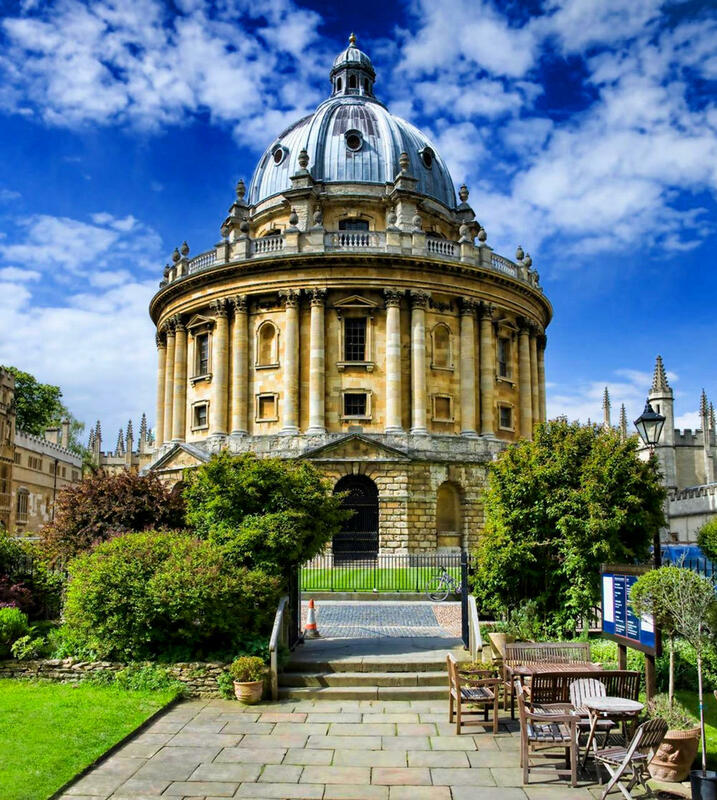 Designed by James Gibbs in the neo-classical style and built in 1737–49, the Radcliffe Camera (Camera, meaning “room” in Latin; colloquially, “Rad Cam” or “The Camera”) was built to house the Radcliffe Science Library. Book lovers, be warned—you might be here a long time. 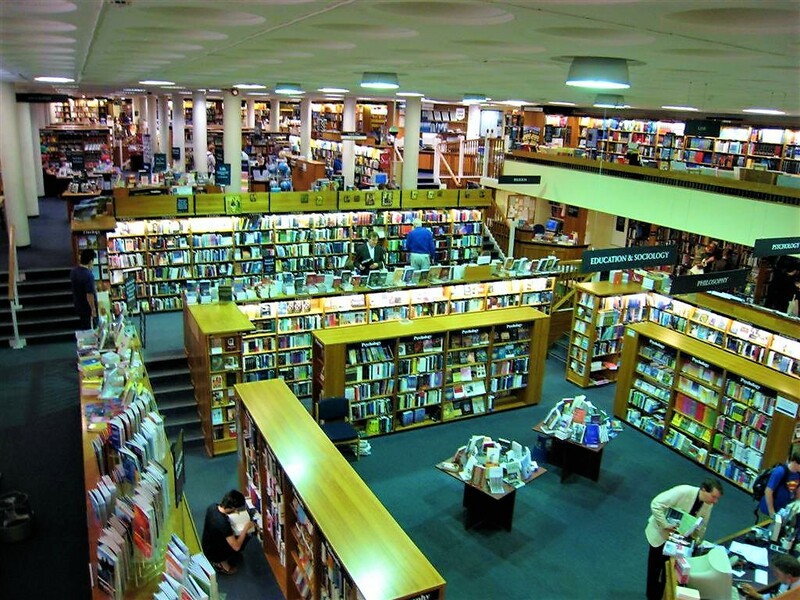 Blackwell’s Bookshop has the largest single room devoted to book sales in the whole of Europe—the cavernous 10,000 sq ft Norrington Room. 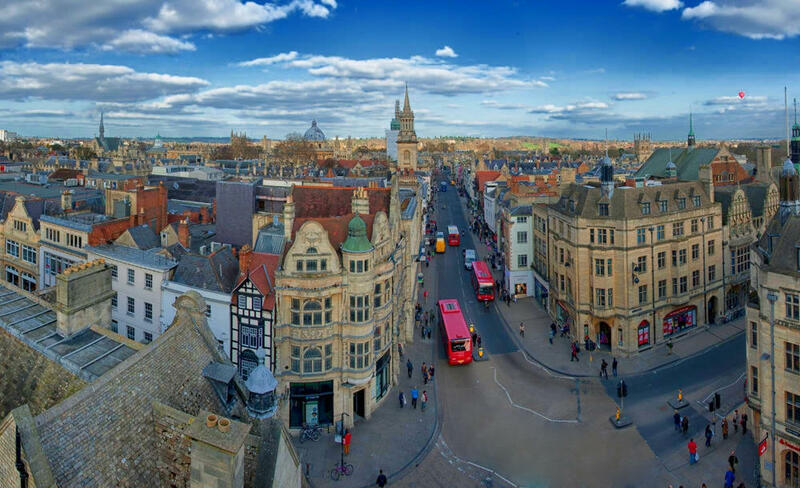 Oxford was mentioned in fiction as early as 1400 when Chaucer referred to a “Clerk [student] of Oxenford” in his Canterbury Tales. 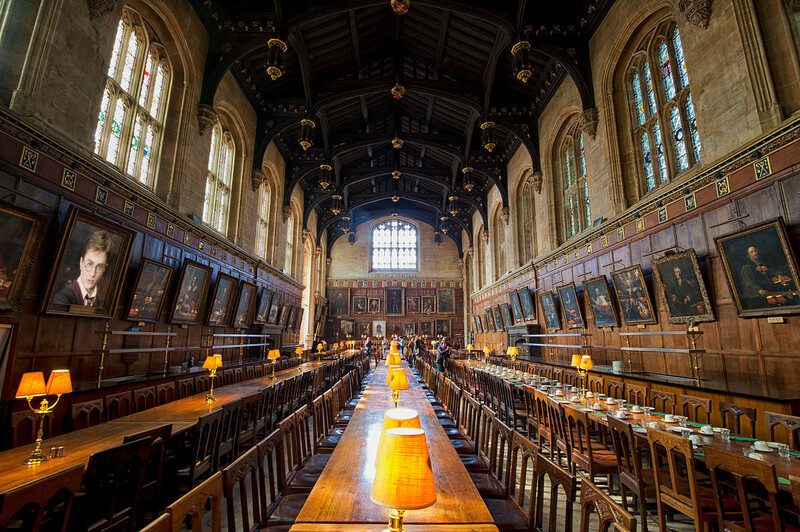 Oxford University’s hallowed halls have been a source of inspiration for several authors of classic children’s literature. 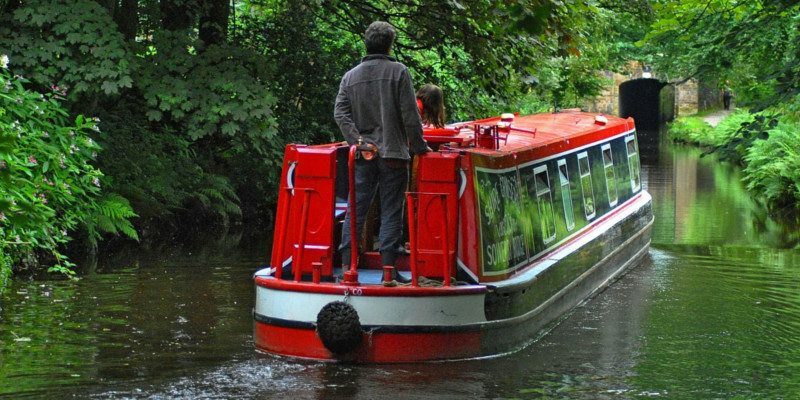 It was July of 1862 and a slightly eccentric young man named Charles Dodgson rowed up the river Thames with a colleague and the three daughters of the Dean of Christ Church college where Dodgson taught mathematics. 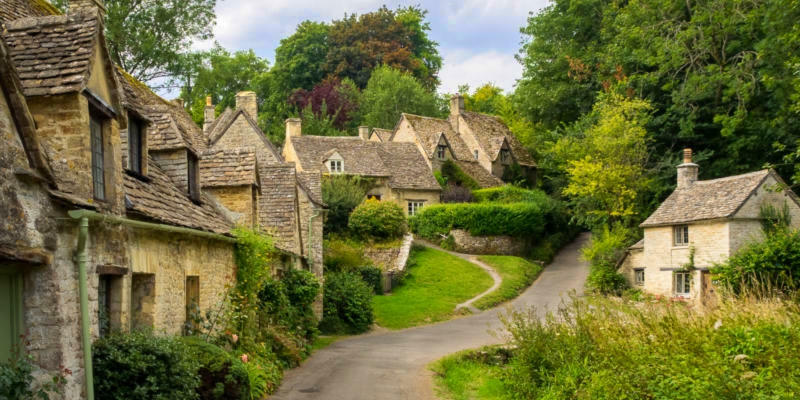 Better known today as Lewis Carroll, the young man told a story to keep the children amused during the five-mile journey to Godstow. 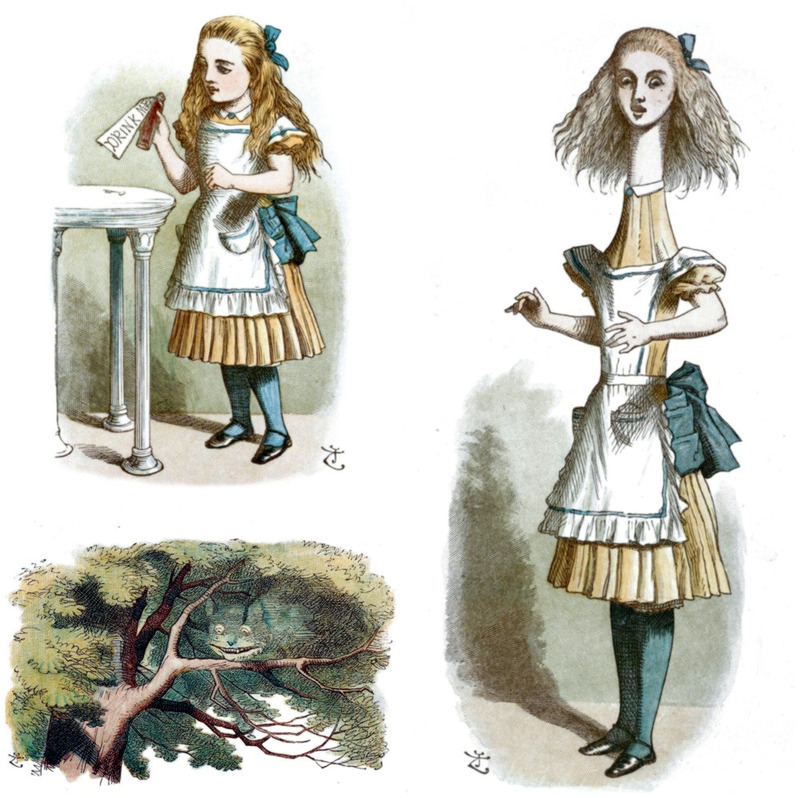 Star of the adventure was Alice Liddell, the ten-year-old middle sister, who, as Dodgson began, had followed a rabbit down a hole. 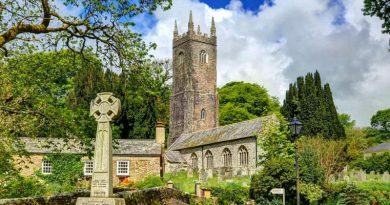 Much inspiration for Dodgson’s story came from Christ Church. The long-necked “firedogs” that held the logs in the fireplace gave him the idea for Alice’s neck to stretch. When Alice Liddell’s father, the dean, descended a narrow spiral staircase, it reminded him of a rabbit disappearing down a hole. And a cat perched on a mulberry tree outside the library was the inspiration for the Cheshire cat. 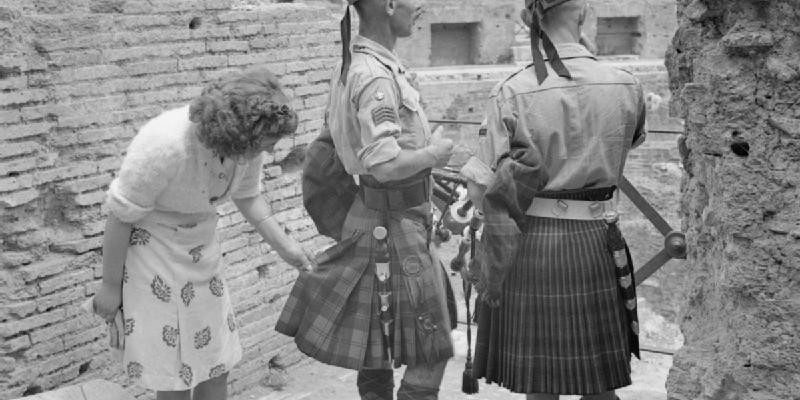 Studying English Literature at Oxford University when World War One broke out, J. R. R. Tolkien finished his degree before enlisting in the Oxford University Officer’s Training Corps. 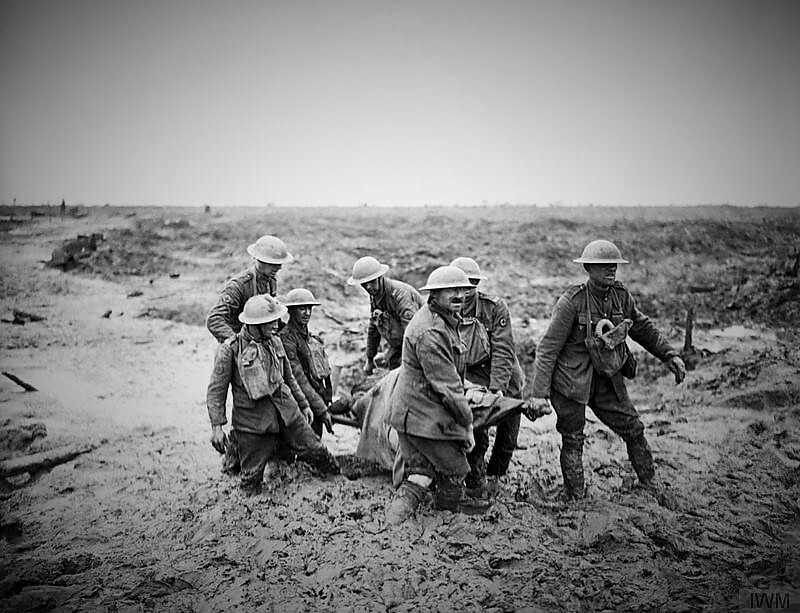 It was the experience at the Battle of the Somme, where one million men were wounded or killed, that helped him describe the evil barren landscape crossed by the hobbits on their way to Mordor. 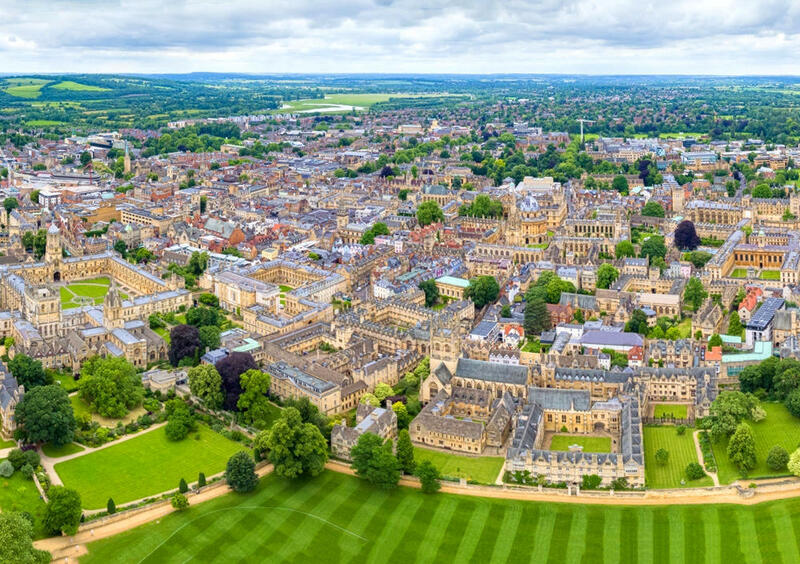 The “Inspector Morse” and “Lewis” TV series were both set in Oxford as were “Brideshead Revisited” by Evelyn Waugh and the trilogy “His Dark Materials” by Philip Pullman.